Cupcakes 'n Daisies: Name This Dog . . . .
On Monday I blogged about the latest addition to our family, my daughter adopted this dog over the weekend. Jackie suggested asking my fellow bloggers for help with the dog's name, and said that's how she got the name for her kitten. Well that dog's no closer to a name, (it's currently being called doggy!) so I figured calling upon my creative blogging friends for a little help couldn't hurt. Can you stand one more contest on my blog, it seems like that's all I've been doing lately? So here's the deal, leave a comment with your best suggestion for a suitable name, for every comment I get, I will make a one dollar donation to the group that rescued the dog. If your name gets selected (by my daughter, I have absolutely no say in this one) you get a prize. So here's a little information to help you . . . This little guy is a dachshund/chihuahua mix, aka "chiweenie", is 6 months old, lives in California, and weighs 10 pounds soaking wet. He's very playful, energetic and happy. Oh, and he likes to bury his treats in the ground. So let's have it, I can hardly wait to read what you come up with! Cooper seems to be saying, "Hey, what about me, what's up with all this puppy talk"
Cooper, you're still the number one dog in our house! I'm up to date on my Kate Spain Fat Quarter Shop Designer Mystery BOM, pictures tomorrow! Fun:) Hoping to see photos of Cooper and his "grand-pup" one day. The name that came to mind is Jeffrey. I had a black and tan Yorkie named Jeffrey. It was a dignified name for a small dog. I actually loved the name. When we had our son, I would have loved to name him Jeffrey, but that would have gone over like a lead-balloon with my MIL:) Have a great day! I'm heading to quilt shops today for the Atlanta Shop Hop. Fun! oh Cooper don't worry you will always be top dog on this blog!!!! Kathie who is NO good at naming things! I don't know why but I think he looks like a Pepper. Maybe since he looks really peppy. Or maybe Charlie as a more serious name. But then again I have such a hard time naming things. Oooo... so glad you ran with the idea and how fun!! I love how you are going to donate to the rescue group too! I don't know why food comes to mind here but I like Hershey and Brownie. Those ears! He looks like he could take off and fly with them! He's like a little bitty airplane - a Piper Cub. How about Piper? So cute! I think he looks like a Samson (or how about the opposite...Goliath)! I think he looks like a Charlie! How about Radar. Look at those ears:) They look like radar equipment. Congratulations on your new grandpuppy! The ears definitely stand out! With those big ears he reminds me of Clark Gable! So I would call him Gable, or else Otis! I love Otis for a dog and he really looks like one! What a great idea! How about Chewie? He is a chiweenie, after all. He is really, really cute! As far as a name, I'd go for something that reflects at least one of his "origins." Whatever you name him, he looks like a puppy you are going to have fun with! I have no idea what to name him....but want to tell you, I have a granddog of this breed...the smartest dog I have ever seen....and that is not just because she is my granddog. By the way, her name is Darla Sue. He looks like a "Duke" to me. Using your love of Reese's (and mine I might add) as insperation. I think he looks a little bit chocolate & a little bit peanut butter. I would have to name him Gremlin, because his ears remind me of those creatures from the movies many years ago! What a cutie! And those ears! How about Montezuma..he might end up with Monty Zooma but that's ok.
Those cute ears remind me of Yoda from Star Wars, so that's my suggestion! Does your daughter like video games? There was a dog named Yoshi at the vet the other day - maybe one of her favorite characters would fit this dog's personality. I would call him Nugget. He is so tiny, but is a "gem". Mickey is what came to mind for me. How about Gizmo? Sounds kind of like a fun name for a little dog with a big personality. I missed all the uproar yesterday. I think people need to be careful with words because they can either build one another up or tear someone down. Words can really hurt. What a cutie he is. And of course Cooper is very handsome too! How about ZEKE (zee.ke). He looks like "Jake" to me. That was the first name that came to mind. He is is super cute! He is a cutie-pie... how about Chester, Digger, Striker, or Teddy? I'll be staying tuned to see what the final decision is!! If he is a fast runner can call him Rocket. Fun, lots of good names suggested. Can't wait to see what name you end up with. How about Sparky? His little ears are so cute:) I can't wait to hear what his name will be. hmmmm.... he looks dignified, but somewhat sassy and mischevious! How about D'artagnan (of Three Muskateers fame) which could be nick-named/shortned to "Dart"
I vote for Henry or Fred...We always give our dogs "people" names...no spot or rover for us..
How about Willie? I think that is a cute name. Just so you will donate to the rescue fund... LOL... he looks definitly like a.... Julio. A friend has a chihuahua named that and it fits him so well. Well if I'm honest the thing that sprang to mind when I looked at him was Einstein! Don't know quite why - something about the ears I guess! LuLu just told me that he should be named "Blue." Mom also suggests "Wookie." I think "Schultz" would be good too. http://en.wikipedia.org/wiki/Figaro Mostly because it's fun to call him figaro, figaro, figaro like in the Opera (see link) Also Figgy would be a cute name. I really get a kick out of it when dog's have people names. This little guy looks like a "Petey" to me. He is adorable! How about Duggar? He looks like a Sidney to me. Aw what a cutie! How about Pip~ short for pipsqueak. :-) Or if you like people names~ Marty. I love people names for animals, I have 2 dogs and a cat. Their names are Melvin, Oliver and Martha. This little guy looks like a Jack or Jim. He is a cutie, love those Cooper picks and all of your quilts they are beautiful. I think the first picture shows his "greatness" and he looks like he is a king ruling over his kingdom. Therefore I vote for "Maximus the Great". Thank your daughter for adopting from a shelter and thank you for donating to one! How about Buster, Buzz, or Jenner? I like Bandit!! How about Zorro? He looks like a Zorro. WOW, there have been so many good names suggested so far. It's hard to come up with another one, probably harder to pick one - but that's your daughters job. I was going to suggest Bogie, but I think that was already mentioned, so my suggestion is DIRK, as in Dirk Pitt from Clancy novels. Slippers, his ears remind me of fuzzy slippers. slip for short, he is jist a slip of a dog. I like the name "Pee Wee". Of course, if he's hard to potty train that name might take on a different meaning. "Fruffy" is the name suggested by my DD. He's so cute! The name that popped to my mind was Tucker. Don't know why, it just did. Over the years we have had Tuffy, Freckles, Blondie, Lovey, and Pistol Pete. Loving the suggestions so far! I think his eyes are very mischievous - as someone else said...my suggestion would be Mischief but then call him "Chief"
My mother had a black and tan chihuahua called Pancho and Doxies are German so I think he should be called Hancho. All our dogs have been named after mystery book characters: Agatha, Watson, etc. 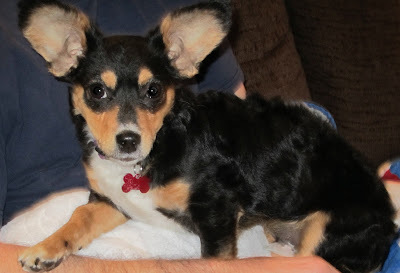 His ears look kinda big, so I would go with Gizmo, Gizzy for short! He is very cute! In honor of my all time favorite movie "To Kill a Mockingbird", how about "Scout"? And yes I know Scout was a girl, but this little guy's inquisitive eyes reminded me of her. I think it is great that you are donating to the rescue group, my grandogger is a rescue pup! If you name him "Mini", you'll have a Cooper Mini. . . Ba Dum Bum. How could we resist trying to guess a name, a few months ago we ourselves got a rescued dog. 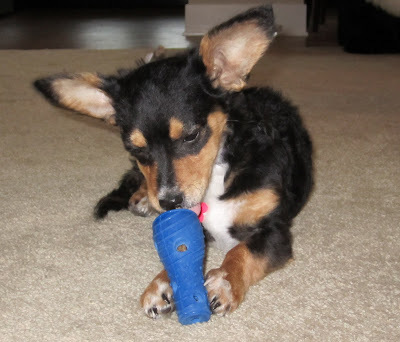 He is a chihuahua/rat terrier mix. He weighs 6 pounds 4 ounces. He is so happy and wonderful. Thank you so much for donating to such a good cause. So many dogs who would give anything to be in a home. As I showed everyone what your adorable puppy looked like we had many awes. As soon as my husband looked at him he said "his name is "Chowder", it just feels right. My daughter wanted a guess too and chose:"Spencer"
Thank you for the chance to name the cutie! oops-continued. spends very little time outside in our Michigan winters but enjoys the warm sun thru the windows. She taught Jack how to bark at the UPS trucks--and anyone else driving into our 'space'. How about Oscar--as in Oscar Mayer--since he's a chi-WEENIE. Or maybe he can be Oscar de la Chichi or Oscar de la (your daughter's last name). Whatever his name is, he's a cutie! Bless, he's so cute (but not as cute as you, Cooper!). My suggestion is 'Batty' (in honour of his 'bat ears'!). I know it's the wrong post but I love your Christmas quilt - such lovely colours and blocks. He looks a lot like a dog we had growing up. The name was Doxie. I think your grandpuppy looks like an Oscar - a name which celebrates both sides of his lineage!